The quote above and the title of my latest work was taken directly from a conversation I had with Sophia, mother to a grown up son affected by severe autism. 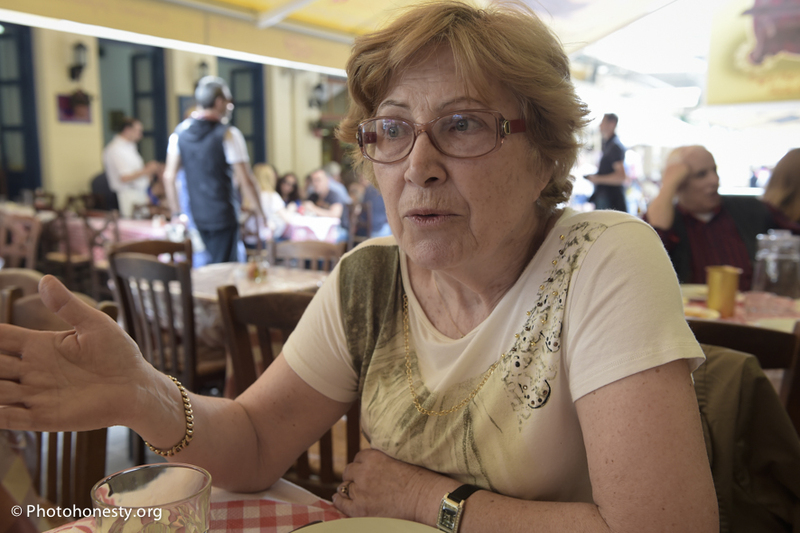 I was sitting interviewing and photographing her with Thanassis, President of GSPAP, Greek Society for the Protection of Autistic people in the main square in Athens at the beginning of a what was to become a remarkable week in June. I’m part of M55 a photo collective made up of former MA graduates of LCC in Documentary Photography and Photojournalism and I’d been invited to spend time in Greece focussing on an aspect of the financial crisis. Given that almost all my work focusses on challenging stigma it was important I work with the disabled, making the assumption that those who were less able to care for themselves would be affected more. In the true traditions of photojournalism I tried to park that view and wait to see what the situation was really like. It was around nine months in the planning as it proved understandably difficult to gain access to public institutions looking at one point that I’d need to cancel my trip. 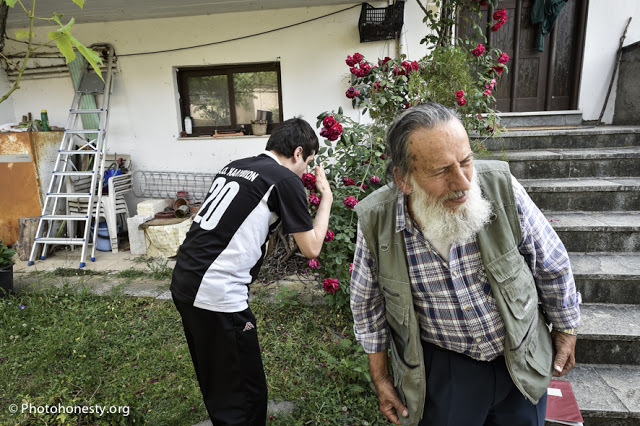 It was then that Christina Vazou, a photographer, who is also part of M55 and who lives in Greece, made a connection with GSPAP and I was able to speak with Sophia, a former board member, by telephone who helped me to liaise with the society and receive official approval to take photographs and publish the work. 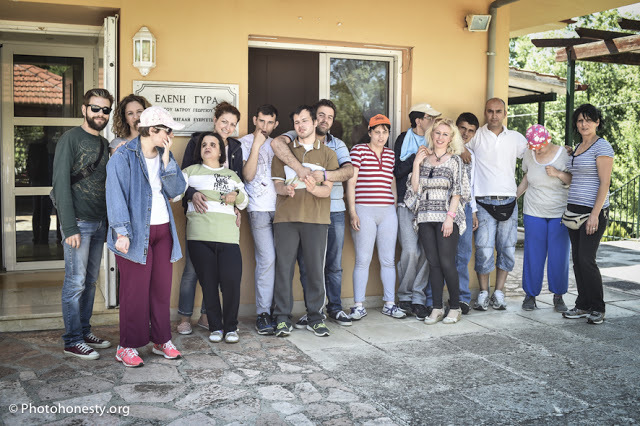 The charity have two centres in Greece. One, the only full time residency for those with Autism is located in a place called Zitsa and so after settling into the apartment in Athens I packed for my 1 hour flight to Ioannina early on Tuesday. Packing critical as I was carrying a lot of camera gear which had to travel in the cabin with me. 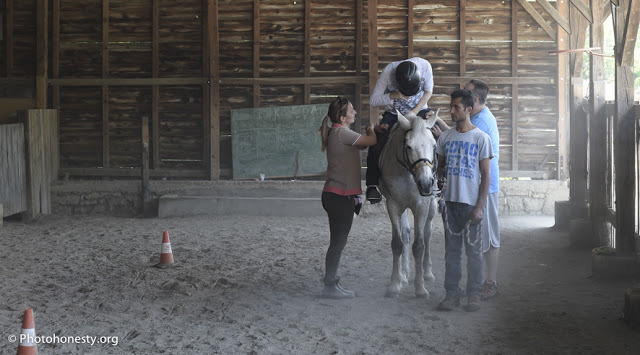 I’d been given permission to live in the house and take photographs over three days and was collected from the airport by the dynamic Margarita who took me first to a therapeutic riding centre where the ‘children’ were enjoying their weekly visit. It’s estimated there are 100,000 people affected by Autism in Greece and yet only one specialist residency accommodating 12 people exists. The intention in the beginning was that residents would stay for a defined period and return to the community but most have actually lived there for 12 years. The house is been supported by additional funding from the European Community which is due to run out at the end of the year. While I was there it was unclear if the funding would be continued and staff had been unpaid for two months. Two years previously they had gone unpaid for six months. Both situations a consequence of the crisis and delayed arrival of government funds. I found my first day in the house a little frightening and unfamiliar but only because it was an unusual situation for me. Occasionally the bird song and tranquility of the countryside would be interrupted by murmuring or shouting. I recorded some sound as well for incorporation into the exhibition of the work to take place at a later date. By day two I became totally immersed in my time there and understood the routine of the house with a combination of activities followed by relaxation in the sensory room. At one point one of the children ran crying to me and held me tight – as I patted his back and reassured him I was aware of two of the educators standing either side of me and ready to intervene if necessary. They told me afterwards that this was a sign of my acceptance. The ‘children’ go home for one day a week and I was able to travel in the minibus with two of them to witness and photograph the reunion. I understand very well why GSPAP have the ambition to create more centres like these. The level of care was at the highest level and the staff put heart and soul into the work. This level of caring was in direct contrast to the image of Greece being presented in the press. These were not lazy people, but highly committed, loving and dedicated individuals who would continue to work day and night to ensure that their charges received the best of attention. And thats despite not being paid. I returned to Athens Thursday and spent Friday morning at GSPAP’s day centre in Athens switching to black and white photography where I am more comfortable. With a trip to the beach arranged I was the only person happy to see rain clouds gathering as it made for a more dramatic sky and better light. Very challenging to make a movie about a routine interesting for the audience and Villy and the team have done it beautifully. I left Greece inspired by the people I’d met and convinced again that I must continue to do the work I do. The team in Zitsa led by Margarita have left a life long impression on me and I’ve promised to return to collect the T shirt that I left behind. Margarita tells me that the Greeks would see it as fate that I left one of my belongings behind. It means ‘I will return’. Regarding the work – the pictures you see here are designed to give you a feel for the time I spent in Greece and I now have an additional 50 images pre selected for exhibition. I have limited connections with the press and have been unsuccessful so far in getting the work published. Thats a great shame given that what I have seen provides balance to the overall negative coverage I’ve seen in the press. It is however planned that a group exhibition take place next year in Greece. Linka another of the M55 photographers has agreed to take one of the images and create a lightbox which will be stunning. When I receive it I’ll then try a ‘Kickstarter’ to raise funds for 15 to 20 more. I hope by then to have a number of venues arranged and hope to reach out to the National Autistic Society to gauge interest in supporting the exhibition. Watch this space for an image of the lightbox and more information as the project moves forward.